What is a threat? In order for a threat to be a criminal offence, does the person making the threat have to “mean it”? Does the recipient of the threat have to be aware of it, or believe it? 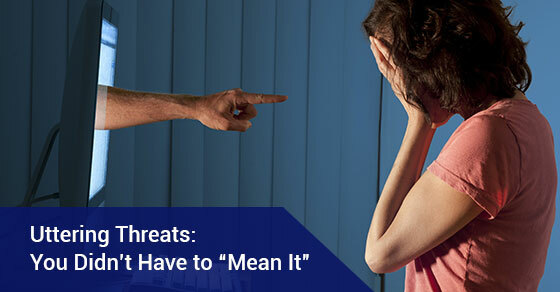 The online world is a battleground for threats and harassment. In November 2011, 15-year-old Rehtaeh Parsons committed suicide after she was allegedly sexually assaulted by four teenage boys at a party. The circulation of a digital photo of the sexual assault on social media prompted Rehtaeh’s death to make international headlines, prompted new legislation, and breathed new life into an unending debate about cyberbullying and threats made online. The advent of Facebook, Instagram, Twitter and the multitude of various other social media platforms have demonstrated just how toxic the digital world can be for its online users. A recent Pew Research Centre survey suggests that as many as 40% of adult online users reported being harassed, and the recipient of online threats. In December 2014, the Supreme Court case of Elonis vs. United States highlighted just how pervasive death threats are in the larger online world. In Elonis vs. United States, Anthony Elonis’ frequent lyrical Facebook statuses and updates contained verses about killing his estranged wife. The issue before the Supreme Court in Elonis vs. United States was whether these seemingly spontaneous and creative Facebook updates by Elonis constituted real threats. While the American criminal elements of uttering threats are different than its Canadian counterpart, the question of whether an uttered threat “should be taken seriously” remains at the heart of the issue of both the criminal justice system and public alike. In the case of R v. Jama, the offence of uttering threats to cause death was determined to have two essential elements. First, that the actus reus(or the “action”) was to utter or convey a threat to cause death. The Court must consider the words uttered to threaten death, and assess these words in their ordinary meaning. The Crown, or Prosecutor does not have to prove that the intended recipient of the threat was made aware of the actual threat, or that the intended recipient of the threat was intimated by the threat. In other words, the Crown does not have to prove that the intended recipient of the threat “took it seriously.” In R. v. McRae, the Court similarly applied the same test of assessing the ordinary meaning of the words uttered to threaten, and whether a reasonable person would view such an utterance as a threat. R. v. Jama determined the second of two essential elements to be that the mens rea (the “guilty mind” or intention) was the intention to threaten death. In R. v. Jama, the Crown was tasked with proving beyond a reasonable doubt that Ms. Jama meant the words she said to intimidate or be “taken seriously.” A subjective test, the Court must assess the Accused’s state of mind. The Court may consider the words uttered, and any and all other circumstances surrounding the uttering of the threat. In other words, the fault element of the offence of uttering a threat is made out if the Accused intended the words uttered or conveyed to intimidate or be taken seriously. In order to determine the Accused’s state of mind, the Court will often have to draw reasonable inferences from the words uttered, the circumstances surrounding the uttering of the words, including how the words were perceived by those subject to hearing them. Canadian criminal law does not require the utterer of such a threat to be in the position or have the means of carrying out the threat. Canadian criminal law does however require proof of the individual who made the threat, and this isn’t always easy to determine or prove in the online world. Proving who was behind the keyboard is often difficult. Making threats can attract severe penalties. In Canada, anyone who commits an offence of uttering threats is guilty of either an indictable offense and liable to imprisonment for a term not exceeding five years, or an offence punishable of summary conviction and liable to imprisonment for a term not exceeding eighteen months.